One of the reason why the Tories are struggling in the polls is because the closer we get to the election the more they look like a leaderless shambles. Critics say the flyers are alarmist and misleading because they imply limits could be imposed on entrants from EU countries such as Poland. This contrasts starkly with a broadcast on YouTube yesterday in which Cameron, who is under heavy pressure from parts of his party to focus on immigration and tax cuts, insisted he would not lurch to the right to try to win votes: "It's for us to be both modern and radical. Not to go back to the old ways and not to play it safe." However, the Observer points out that for the party's grassroots immigration is key and they want to build on comments made by Cameron last month: He promised the party would drastically reduce net immigration levels by imposing a cap – to prevent the population rising above 70m. The impression that the Tory leader is under siege within his party was further heightened last night when the Tory right mounted a fresh demand for drastic tax cuts which Cameron is unlikely to be able to deliver. The Observer reports that Tory MEP Daniel Hannan hosted an event called the Brighton Tea Party, named after the Tea Party movement in the US, which has gathered huge public opposition to high taxation. It is little wonder that the voting public, disillusion with Gordon Brown's Labour are turning up their nose at the Tory alternative and that many are taking a fresh look at Nick Clegg's Liberal Democrats. Has Lembit's phone been hacked? In 2007 the News of the World's royal reporter, Clive Goodman, and Mulcaire, a private investigator, were jailed for illegal phone hacking. The paper's editor Andy Coulson, now David Cameron's communications chief, resigned. He recently said he knew nothing about the unlawful activity, and the paper claims these were rogue episodes. But last week the Commons Select Committee for Culture, Media and Sport published a report accusing the newspaper's executives of "collective amnesia" and "deliberate obfuscation". It has also emerged that the Metropolitan Police has evidence of Mulcaire being in possession of pin codes for 91 other people, which could have been used for hacking. Now, Manchester-based lawyer Charlotte Harris, who has previously represented Max Clifford, is to ask the Metropolitan Police if Mr Őpik's pin number was among those found when they raided the files of Glenn Mulcaire. Asked how far he planned to take his case, Mr Őpik said: "Let's get the facts and move on from there." Asked if he was making a political point to embarrass the Tories, the Lib Dem MP said: "I'm not pointing fingers at anyone yet." One of the features of the proposed cull of badgers in North Pembrokeshire is how little information has been made available to anxious residents about timing and even the boundaries of the cull area. As part of my scrutiny role and so as to seek clarity on some of these issues I wrote to the Minister a few weeks ago and have now had a reply. The letter that was sent to me however, was at best esoteric, at worst deliberatively unhelpful. In particular the Minister states that she 'has no plans to release information detailing the precise boundaries for the pilot area because of the sensitive nature of the measures being taken forward.' Really? It is not as if she is planning an invasion. Or is she? I suppose her main concern will be that the badgers might get wind of it and do a runner over the border. Seriously, I can see no reason whatsoever why the boundaries of the cull area should be a state secret. Now that I have got Carly Simon out of my system I will note that the Secretary of State for Wales is all over the Welsh media today like a rash. However, unlike the song his tone is rather discordant and misjudged. Peter Hain is of course quite right to criticise the £1.6 billion in bonuses being paid to certain RBS staff. In doing so he is tapping into the mood that has bankers as the only profession lower in public esteem than politicians. However, what he has conveniently not mentioned is the role of the Labour Chancellor of the Exchequer in approving these bonuses and the failure of his government to properly regulate the banks so as to prevent this crisis in the first place, despite timely warnings from the likes of Vince Cable. Mr. Hain is also performing his usual function at this time in the Parliamentary cycle in rallying the troops and once more warning the supporters of other radical parties of the dangers of a Tory Government. It is noticeable though that his call for tactical voting does not go so far as asking people to switch from Labour to the Lib Dems in seats like Brecon and Radnor. It is not the prospect of a Tory Government that worries him, it is the survival of him and his government. For that reason alone it is difficult to take him seriously. Labour had its chance in 1997 and put narrow party advantage obtained via an unfit for purpose electoral system first. In other words they blew the radical consensus that was built up by Paddy Ashdown and Tony Blair and left us with very little to show for it. They no longer deserve the vote of progressives. One of the more fascinating reports on the agenda for today's meeting of Swansea Council was the scrutiny committee report on the Swansea Metro. This has been a matter of great controversy in the City even though the road works associated with it were funded by Government Transport Grant and the bus company paid for the buses themselves. Nevertheless, it is proving very successful. Bus services in Swansea were not considered to be adequate, in termsof coverage, frequency, reliability, information, social need and customer care. The Council has little control over bus services. Major improvements can therefore only be achieved through effective partnership with First Cymru. Resulting from this, the original idea of a new concept cross city bus route in Swansea was raised at meeting between the Chief Executive of First Group and the then Leader of Council and Cabinet Member for Technical Services in August 2003. The was followed by technical meetings between First and Council officers to develop the concept and agree the way forward in late 2003/early 2004.
agreed that the existing Transport Grant bus corridor package funding could be used to fund a feasibility study. Arup, Consulting Engineers, subsequently were commissioned to carry out a feasibility study in June 2004. Labour lost control of Swansea Council in June 2004. Although they did not actually apply for the grant funding themselves the origins of the scheme clearly rested with their administration. Why are they so shy about admitting this? The slogan itself is old, first used back in 2003. Then, like now, the poorest paid a higher proportion of their income in tax than the richest. But there is a difference: then, the gap was about two percentage points. Now, it is about four percentage points. In other words, the gap between what the rich and poor pay in tax has doubled. This is a staggering change. If anyone deserved tax cuts in the last seven years, surely it was those who were finding it hardest to make ends meet, not those at the top? When I asked Gordon Brown about this yesterday at Prime Minister's Questions, he avoided the question. He said I'd forgotten tax credits. But what he knows perfectly well is that those damning figures include the effect of tax credits, penny for penny, pound for pound. Brown is hiding the truth that, even after every last tax credit has been handed out, the poorest are still the ones hit hardest. Just imagine how it feels to struggle so hard just to make ends meet knowing such a huge chunk of your meagre income goes straight back to Treasury coffers. Labour has no basis on which to claim the ground of fairness any longer. Their record is one of rising inequality and unfairness. The roll-call of failures is long. Income and wealth inequality have not improved a jot in 13 years of Labour. A child born in a poor part of Sheffield will die 14 years before a child born just up the road. Even the brightest children from deprived backgrounds are likely to fall behind their more affluent classmates at school before their seventh birthday. Thousands of children are in classes so big they're technically illegal. Carbon emissions are higher than when they came to power, a devastating example of inter-generational unfairness. Our political system can be bought and sold by big donors. Only in Gordon Brown's bunker can any of this be considered fair. Based on what has happened since 2003, Labour's words are not a slogan at all. They are a warning. Even when all the sound and fury over the allegations of bullying in Downing Street which have dominated the headlines this week have died down, this legacy of unfairness will remain. This is not a question of character, it is a question of values and priorities. Labour has failed on fairness. Only far-reaching change can make the future fair as it should be. All those millions of voters who flocked to Labour in 1997 with great hope for a fairer future must not despair, but look elsewhere for a political home. I was a bit bemused today to see an advertisment in the Western Mail from Her Majesty's Prison Service and Parc Prison Bridgend for various jobs in the new house block that is opening at Parc. It was not the fact that the jobs were being advertised me that intriqued me but the way that they were being sold. The advert starts off: 'HMP and YOI Parc is going through a time of excitng growth' I am not sure that others will view the expansion of the prison estate and an increase in the number of prisoners in quite the same way. A press release from the Kennel Club offers the very welcome news that Wales’ Rural Affairs Minister, Elin Jones has agreed that, subject to approval by the National Assembly for Wales, the use of electric shock collars will be banned in Wales. This is a useful addition to the animal welfare measures in place inWales. It is a shame that the same concern does not stretch to the preservation of protected species such as the badger or the biodiversity in our countryside that they represent. Just when you thought that nothing more could go wrong for Gordon Brown further troubles appear through an extraordinary interview with Alisdair Darling. Speaking to Sky News the Chancellor of the Excheqeur said that people working for Mr Brown tried to damage him because he told the truth about the economy. His remarks follow reports in a new book by Andrew Rawnsley that Mr Brown’s aides tried to undermine him after he forecast the worse economic downturn for 60 years. “Nobody likes the sort of briefing that goes on,” Mr Darling said, “the forces of hell were unleashed”. According to the to book, allies of Mr Brown including Charlie Whelan, a senior union official, and Damian McBride, then his political spokesman, then began a systematic campaign to undermine Mr Darling over the “60 years” interview, raising the prospect that he would be sacked. All this does of course is to reopen the speculation stirred up by the book and add further to the impression of a divided government. It is not good for Labour at all. Interesting article in today's Guardian regarding an Electoral Commission report into the Glasgow North East by-election that highlights just how competitive elections are getting at the moment. The commission also challenged Labour for delaying the byelection for nearly five months after the resignation of the then-Commons speaker Michael Martin. It moved the writ 116 days after Martin moved to the House of Lords. The Commission said the byelection could have been held "much earlier" and urged parliament to introduce rules to ensure it held byelections "promptly". It added: "The length of the vacancy in the Glasgow North East constituency meant that people in the constituency were not represented in the UK parliament for more than four and a half months." Will this change things. I doubt it but a marker has been put down and no doubt it will be revisited after the General Election. The BBC report further developments on the proposed badger cull in North Pembrokeshire, with yet another expert wading in to describe the Rural Affair's Minister's decision to proceed with wiping out the area's badger population as 'perverse'. "I think the decision to cull flies in the face of the science," he said. "They've got to take account of the fact that it will raise the prevalence of TB in badgers, there will be a negative edge effect. "The benefits - if there are any - are likely to be rather small, and they won't be able to tease out what the effects of culling are because they're including culling with cattle control measures so you can't separate those scientifically in the results. "Altogether I think it's a perverse decision which, even at this late stage, should be rethought." The government quote a range of advice they have taken on this issue as did the Rural Affairs Committee, however they appear to have been only partly listening. The trials in England found that although badger culling reduces cattle bovine TB during the trial and immediately thereafter, the beneficial effects are not sustained, disappearing four years post-cull. There is also a danger that by stirring up the badger population bTB will spread more widely than it would otherwise do so and also spread outside the area of the cull. It is for these reasons, as well as fears about government agents compromising biosecurity by trampling over farms, concerns for biodiversity and outrage at the way that a protected species is being treated by Government that resistance within the cull area is growing, including amongst landowners and farmers. The media this morning continues to be full of allegations and counter-allegations about Gordon Brown's behaviour in 10 Downing Street. On social media sites the Tories are seeking to press home what they perceive to be an advantage with comments and different angles on the affair. Meanwhile, Labour bloggers and tweeters such as John Prescott are engaging in a combination of defensive questioning as to the authenticity of the allegations and distraction techniques such as links to blogs questioning the motives of the anti-bullying charity and references to other bullying allegations surrounding David Cameron's Head of Communications. Bullying of any sort is indefensible but what we have here is a row that is generating more heat than light on the subject. It has become a battle over the Prime Minister's character. Is he a passionate, determined individual who gets carried away now and again or is he the type that pushs people around, and whose demeanor and behaviour generates fear rather than respect. It is a fine line that is easily and often crossed and the tragedy is that now that the spin doctors have got hold of it and because so much is at stake, we will not get any clarity nor, more importantly, any proper debate about what is acceptable and what is not in the workplace. Can the Tories win outright? Putting aside allegations of temper tantrums in Number 10, my attention was drawn to this article in yesterday's Telegraph in which they go to former Conservative Deputy Prime Minister, Michael Heseltine for his assessment of what is going to happen in the General Election. They say that Hezza has stunned activists by claiming that history is against Mr Cameron’s hopes of securing an overall majority. Instead, the man who stormed out of Thatcher's Cabinet has said he would "put money" on a hung parliament, with the Tories the largest party. He believes that Mr Cameron would then be forced to call a second election later this year to seek a proper mandate to govern. Frankly, that is one opinion amongst many and is as valid as anybody else's. Still it might be worth a punt if you overlook Heseltine's previous form on predicting election results. If memory serves right he predicted a Tory majority of 60 back in 1997. So how did that one work out again? Not too long ago I sat near Simon Hughes MP in a standard-class carriage on a train (Tory calls first-class ban 'infuriating', 19 February). It was my intention to nod the journey away. No chance. Hughes never stopped working. He received and made countless phone calls, was up and down to access his briefcase and spoke to everyone who recognised him. While I admire his work ethic and cheerful disposition, I would have gladly contributed to a fund to have him upgraded to first class. Those who have suggested that a Labour Government is tantamount to countrywide prison-sentence are clearly being a tad unfair. That is the lot of those unlucky enough to live under the Tories surely. Gordon Brown's new election slogan, unveiled at 10pm last night, must have put paid to the notion that New Labour are linked to any sort of sentence, or grammar for that matter. 'Future Fair for all', is not only not a proper sentence, it does not even have the words in any recognisable order. Because 'Fair' is juxtaposed with 'for all' then it becomes the subject of the sentence, instead of the future we all want. What sort of Fair are we talking about? Some sort of carnival perhaps? 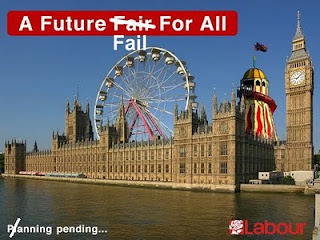 Are we being promised candy floss and the dodgems or are we being confronted with a party that mangles its words so badly that actually the offer is 'a fair future for all'. Whatever happened to 'education, education, education'? The person who thought this up needs to go back to school where no doubt he will be taught (one hopes) that sentences need a verb. It is possible of course to ignore that rule providing that a slogan or phrase is recognisable and understandable. I would suggest that this slogan falls down on both counts. Oh yes, and while we are at it how can we believe that the jam we are being offered tomorrow will be any fairer than the last 13 years of Labour rule? It is not as if they have a record to campaign on, when child poverty is getting worse and the gap between the richest and poorest in our society is getting wider. Come to think of it maybe Labour did mean a fairground. They don't seem to understand what the other type of 'fair' means at all. Note: image shamelessly stolen from Prodicus. Thanks to David Raybould for pointing it out to me. I suspect that one of the reasons why the Tories do not have a commanding lead in the opinion polls at moment is that their leadership does not inspire confidence. David Cameron comes across as a poor man's Tony Blair, whilst George Osborne projects the image of somebody who we could not trust with the household budget, nevermind the country's finances. In two letters, one led by Lord Skidelsky, a biographer of JM Keynes, and former monetary policy committee member David Blanchflower, and the other led by Lord Layard, emeritus professor of economics at the LSE, the economists have written to today's Financial Times to warn that starting a fiscal squeeze immediately could jeopardise the recovery, and "for the good of the British people, the first priority must be to restore robust economic growth". They argue that the increase in the deficit in the last two years was unavoidable, given that the UK has just experienced the most severe recession since the ­second world war and GDP has fallen by 6%, forcing emergency government action to prevent the economy "falling off a cliff"
This proposal for immediate budget cuts is a hallmark of Osborne's policy. It has already been criticised by Vince Cable for the Liberal Democrats. With so many questions about his judgement perhaps the Tory Shadow Chancellor should adopt the sobriquet 'hapless' before his name at all times. I am on record in a number of places as being opposed to the retention of DNA records by the Police, when the person concerned is innocent. I have also expressed my scepticism of and opposition to a universal DNA bank, which I believe is unworkable and undesirable. However, that does not mean that I am opposed to the use and retention of DNA records when that is justified by the circumstances. None of this chimes with government policy of course where Ministers seem intent on ignoring human rights rulings so as to allow the existing illiberal regime to prevail. Britain's DNA register is the largest in the world and yet according to a report in today's Guardian the Government cannot even get the basics right on that. The paper says that the 83,755 people who are currently prisoners in England and Wales do not all have their DNA profiles logged on the police national database. This contrasts sharply with the number of innocent people — more than 975,000 at the last count — who have been arrested but never charged or convicted of an offence yet whose DNA has been collected and logged. So let us check that we have this right: Britain's criminal DNA database has nearly a million innocent people on its books but many of those who have actually been found guilty of a crime and punished for it do not feature at all. It is hard to fathom what the Police and the Home Office think they are doing. I have never been a conspiracy theorist so I will dismiss all the Big Brother reasons I can think of for this state of affairs and opt for incompetence instead. It is enough to make you weep. There is an important Council by-election in Bridgend today so I do not have much time for blogging. However, this article caught my attention last night and I thought it was worth mentioning in passing. My hearing is not as good as it should be. I had a number of operations when Iw was a child and as a result I sometimes have difficulty picking out what people are saying against background noise. As a result I tend to have the television on loud. Even I have noticed however that once the programme breaks for adverts the volume is significantly higher. Being busy I had always put the phenomenon down to a fault in the TV or my own hearing but now it seems that I have been the victim of a deliberate ploy by television companies to get the adverts noticed. A complaint that breaks during the repeat of the 1984 series starring Jeremy Brett were 'excessively noisy compared to the surrounding programme' was upheld - despite ITV's claims that the commercials merely coincided with particularly quiet parts of the programme. The authority has written to ITV warning that action needs to be taken to ensure it keeps within the rules. Maybe they should dig deeper to see how widespread the practice is. The theory that Gordon Brown is a really unpopular Prime Minister who cannot hope to be re-elected has been blown out of the water today by a survey by student accommodation provider Unite, who have found that most people do not know who he is. The survey found that one in three University students is unaware that Gordon Brown is the leader of the Labour Party, a similar number could not identify David Cameron as leader of the Conservative Party, while only 48 per cent were able to name Nick Clegg as the Liberal Democrat leader. To be fair if more students than this had been able to identify the respective leaders I would have been worried. After all they have bigger things to worry about, such as all the debt they have been saddled with by successive Labour and Tory Governments. Interestingly, the survey also found that half of students said they are unlikely to vote in the forthcoming general election, but almost three in 10 said they would vote if all the main political parties pledged to drop tuition fees. As the only party pledged to phase out tuition fees that finding may be a major benefit to the Liberal Democrats in the forthcoming campaign. Last night I drove to Newport, Pembrokeshire to take part in a public meeting to discuss the proposed badger cull in that area. Over 200 people packed the Memorial Hall, the overwhelming majority of them opposed to the cull. I spoke about the present position following the report on the English badger cull trials and urged the audience to play an active part in the General Election, lobbying candidates to put pressure on their parties to reconsider. There were about 8 or 10 farmers present, all opposed to the cull and one made a strong plea to protect the biodiversity of the area. There was also powerful testimony from a local tourist operator who told the meeting that his bookings for this year are already 70% down because of the prospect of Welsh Government officials trapping and shooting badgers during the holiday season. Many visitors will not come back. Letters and packs have already been sent out to landowners including the Wildlife Trust of South and West Wales. A large part of the cull area is a SSSI. It also includes the Cilgerran Wildlife Centre which includes amongst its activities families watching badgers in their natural environment. Is the Minister going to shoot these badgers in front of those families? Opposition to this cull is of course peaceful but those opposing it are resourceful. In that context the Minister's decision to fund three additional police officers in the area for the period of the cull does seem a bit over the top. Those who believe that this issue is a town versus countryside one are very much mistaken. Opposition to the cull is as strong in the countryside as it is in more urban areas. This is not going to be easy for the government by any stretch of the imagination. The revelation that the Liberal Democrats are planning to rule out forming a coalition government with either the Conservatives or Labour if Nick Clegg holds the balance of power in a hung parliament will be widely welcomed within the party. • Investing extra funds in education through a pupil premium for disadvantaged children. • Tax reform, taking 4 million out of tax and raising taxes on the rich by requiring capital gains and income to be taxed at the same rate. • Rebalancing of the economy to put less emphasis on centralised banking and more on a new greener economy. • Political reforms, including changes to the voting system and a democratically elected Lords, that go further than proposed by Labour. Clegg would give the minority government a chance to deliver and would not expect his demands to be met in full by the time of the Queen's speech, the first major parliamentary test of a new administration. "People expect stable government," one aide said. "It is right to assume that if one party has a mandate it should have a crack at governing. If no party has a majority, then people will need to talk to each other." Although coalitions are the natural outcome of any proportional system of voting, there is no history of them at Westminster other than at times of national crisis. This is not a cop-out. The Liberal Democrats would still be intricately linked to the government of the day but they would be concentrating on getting things done rather than keeping their ministerial privileges. More importantly, in contrast to Wales and Scotland, no party could commit to becoming the junior party in a formal coalition when they have no control over the date of the next General Election. These things only work properly when there are fixed terms and that is not the case in Westminster. The risk is that at the first sign of a crisis the Prime Minister walks away and calls an election instead of honouring the commitments he or she has signed up to. That is why electoral and constitutional reform is an essential prerequisite to such an agreement. It is the only way to guarantee stable government. I have to admit that despite being a keen watcher of Dr. Who for most of my life I had not noticed the phenomenon described by Sylvester McCoy in this morning's papers. In fact did anybody notice? At the time Tory party chairman Norman Tebbit claimed the BBC was in the hands of the “Marxist mafia”. “The idea of bringing politics into Doctor Who was deliberate, but we had to do it very quietly and certainly didn’t shout about it,” said McCoy in an interview with a Sunday newspaper. “We were a group of politically motivated people and it seemed the right thing to do. At the time Doctor Who used satire to put political messages out there in the way they used to do in places like Czechoslovakia. Such storylines included The Doctor encouraging the drones, who worked tirelessly in factories and mines, to down tools and revolt against the rulers – echoing the miners’ strikes of the mid-80s. Thatcher herself was caricatured as Helen A, whom fans of the show will remember as the wide-eyed tyrannical ruler of a human colony on the planet Terra Alpha. Sheila Hancock played an extra- terrestrial character who outlawed unhappiness and said, “I like your initiative, your enterprise,” as the police rounded up those who went against the laws. There are fears that if David Cameron wins the General Election then the his government will start to dismantle and emasculate the BBC. I hope that this is wrong but if the likes of Sylvester McCoy keeps feeding them with this sort of ammunition then anything could happen. The Tories chose David Cameron because he looked and sounded like Tony Blair, Discuss. Well if they didn't some of them sure are getting more than they bargained for, with suggestions in yesterday's Daily Mail that the Tory leader is displaying the sort of control freakery for which Tony Blair was famed. MPs were stunned last week to receive orders from Chief Whip Patrick McLoughlin to submit Election leaflets for prior inspection. They were told that in future, they could put nothing in writing to their voters without first getting permission from the party leadership. And to the fury of veteran MPs, they were also ordered to use pictures of Mr Cameron in all their literature. Tory candidates across the country have been told to submit all Press releases and articles to party officials before they publish them. In an email headed ‘Don’t help Gordon Brown’, Tory bosses set out a strict new regime to control what candidates said to their electors. The email, seen by The Mail on Sunday, said: ‘We know that our opponents are monitoring everything our candidates say, whether in print or online, with a view to taking remarks out of context and distorting what you say to undermine our national campaign. ‘No one wants to be the candidate whose leaflet is waved across the Despatch Box by Gordon Brown. ‘To help ensure this doesn’t happen to you, we are putting in place arrangements to check that our message is consistent and not open to deliberate misinterpretation. If the Tories are having problems keeping track of their MPs then goodness knows how they will manage the many blogs and tweets being put out by all their candidates. If there is one issue that continues to dog the Conservative Party and pull them back it is the tax status of their biggest donor, Lord Michael Ashcroft. Whole interviews are devoted to it, spokespeople seeking to get across a wider point find their pitch derailed by questions on it, whilst whole campaigns are being planned around Tory embarrassment in time for the General Election. The Tories' problem is that Lord Ashcroft is pumping millions of pounds into marginal seats. His money could make all the difference between a Tory majority or another miss and yet he remains a controversial figure who continues to hold them back nationally. Last week, Sir George Young, the shadow leader of the house, suggested in a Newsnight interview that Ashcroft was a "non-dom", but a spokesman rapidly corrected the comment, saying Young had "mis-spoken". In an interview to be broadcast tomorrow, Pickles admits that he does not know the financial arrangements of the peer, who has funded the party's campaigns in dozens of marginal seats and is also a deputy party chairman. Asked if Ashcroft was a "non-dom" – someone who pays UK tax only on their earnings in this country – Pickles says he is in the dark on the issue: "I'm not in a position to be able to tell you." Pickles also hints that he is irritated by the secrecy surrounding Ashcroft and the constant media demands for clarity. "I do not know what his tax status is. If I did, I would certainly tell you," he says. Asked to comment on recent comments from the information ­commissioner, who has accused the Tories of "obfuscatory" answers on Ashcroft, Pickles says: "I was very alarmed by that. We have gone back to check what more we could do." But he stops short of saying that his deputy should be more open. "That's a matter for him to consider. Lord Ashcroft is entitled to his privacy," Pickles tells Evening Standard journalist Anne McElvoy for a Radio 4 documentary on the future of party funding. This is of course an issue of public interest and far from the private matter that senior Tories claim. Lord Ashcroft got his peerage on condition that he became a full British taxpayer. He bankrolls a major British party and stands to wield considerable influence in any future Tory government. As such it is only right that we know whether he has fulfilled his obligations to this country. The Cabinet Office has been ordered by the ­information commissioner to reveal, within weeks, the terms of the agreement into which Ashcroft entered as a condition of ­ennoblement. That revelation at least will open up the debate and may put David Cameron under even more pressure to publish details Ashcroft's tax status. I cannot wait. This morning's Times has an exclusive in which they say that both Alistair Darling and George Osborne, the Shadow Chancellor, are considering raising VAT to the European average of 20 per cent from the current rate of 17.5 per cent. The Chancellor is also keenly aware that Britain needs to retain the confidence of the credit-rating agencies. He has privately ruled out either raising income taxes or increasing the scope of VAT, but has deliberately left open the possibility of increasing the sales tax in the next Parliament. It is understood that there are discussions in the Treasury about whether the Government should abandon its deliberate pre-Budget opacity and instead look to win points for honesty by admitting that VAT may have to rise. Ken Clarke, the Shadow Business Secretary, told The Times that any post-election cuts imposed by a Tory government would be worse than the squeeze of the early 1980s. “We are going to have to be much tougher on public spending than Margaret Thatcher ever was,” he said. Personally, I hope that this is not true. I accept that drastic measures may be needed to get public finances back onto an even keel but VAT is a regressive tax that hits the poorest hardest. A rise of those proportions will fuel inflation and hit demand for many goods and services. Surely, it is far better to shift tax rises to income tax which at least relates to people's ability to pay. An increased tax on the very wealthy would have the same beneficial effect on public finances without the same pain for the economy and for those struggling to make ends meet. This morning's Western Mail contains a familar front page story. Will a reasonably secure Labour seat in the South Wales Valleys have an all-women shortlist imposed on it, alienating half the activists and putting it at risk or will it be allowed to go its own way and choose the candidate it wants? The current MP, Kim Howells is reported to have had a stand-up row with Labour's Deputy Leader, Harriet Harman in a House of Commons dining room on this issue. He denies this incident ever happened. Nevertheless there is no denying his strong view that Pontrypridd should be able to select its own balanced short list. There is even a link to the last row as speculation is ripe that former Blaenau Gwent by-election candidate, Owen Smith is in the frame for the nomination, if he is allowed to stand that is. Already some activists are saying that they will not campaign for a candidate seleceted from an all-women list. What adds interest to this is the identified beneficiary of this row. The paper says that it is unlikely that there will be an independent candidate to sweep up protest votes this time. However, some Labour activists have named Liberal Democrat candidate Mike Powell as the main threat to their holding the seat. They say that he is a high profile and puts himself about a lot. That is the fairest description of Mike Powell I have seen for a long time and l look forward to seeing him on the green benches of the House of Commons where he will be an asset to the party, Wales and to Pontypridd. If the English Housing Minister, John Healey has his foot firmly enscounced in his mouth today then his Liberal Democrat shadow, Sarah Teather must win plainly-spoken quote of the week. “If this is John Healey’s best response to record repossession figures then he should just shut up. “These comments are grossly insensitive to families booted out of their home. I don't envy Mr. Healey having to defend his comments in the Commons against such forthrightness at his next question time. Departments have been cut as vice chancellors and governing teams wield the axe in line with the preferences of the Whitehall pay – or policy masters. Administrators are seizing the talk of "cuts" to "rationalise", removing small departments and subjects that are expensive, even if academically well-respected. Physics has suffered in the last decade and about 20 institutions have closed physics departments. Now the new cuts, we hear, will mean individual departments will be targeted. In Leeds biological sciences is to be cut; in King's College London the UK's only paleography professorship is to go and cuts will focus on engineering and American studies. Not only that but academics will have to reapply for their jobs. And KCL is one of the universities with reserves. Meanwhile other officials are busy cutting too and the government's Higher Education Funding Council for England has already announced 6,000 student places will go. Cutting academic staff, axing departments, or artificially curbing student numbers from the centre will be very damaging for the universities. Such changes weaken the system, undermine its competitive edge, damage the body of academic knowledge and thought which is part of the wider whole. But it is the easy option of the official mind, those paid (by us) to manage, whether in the universities or in Whitehall. Why not look to other ways of curbing costs? Many of the most successful companies in the UK have not shed jobs, but have taken pay cuts. New posts have been frozen and no new support jobs are advertised. Translated to the universities, this would mean a cull of non-teaching jobs and an opening of the system to allow universities meet, not turn away from, demand for places. In many way Welsh universities are the poor relation to their English counterparts in funding terms, with a growing gap in available finance. If we do not invest in them then it will be our economy that will suffer as well as future generations who miss out on opportunities to improve themselves. That is why the Government needs to urgently address this issue. Elin Jones: The Welsh Government is committed to supporting the promotion and production of food in Wales, including leeks. Elin Jones: I do not think that I could match you as an ambassador for leeks. I would be happy for you to join me when I visit England to promote the wonder food of Welsh leeks, because you are most definitely a great advocate. All-in-all a highly appropriate subject just before the second game of the six nations championship, especially if you are a Max Boyce fan. Social Workers often get a bad press not least in some newspapers who see them as the thin end of the nanny state whilst at the same time blaming them for avoidable tragedies. It is only right therefore that we redress the balance whenever possible. The research, due to be published in the British Journal of Social Work later this year found that England and Wales had experienced an overall drop in child killings of 47%, and are now ranked as fourth lowest of comparable nations. They had been rated fourth highest. Child homicide rates actually fell by nearly 90% over the period, with just three children per million currently falling into this category. However, "undetermined deaths" – those that may have, but cannot be proven to have involved child abuse – went up. As the report's authors Colin Pritchard and Richard Williams say: "Of course, one violent death of one child is one too many, and the numbers of children in the UK today who are still in need are no grounds for complacency. "But perhaps it is time to give some credit to the improvements of the past 10 and 20 years to frontline social workers and the child protection services in England and Wales, which can match the best in the world." Today's Plenary is dominated by health matters but first we have to suspend standing orders. We have to suspend standing orders to change committee membership, to appoint auditors for the accounts of the Auditor General for Wales, to appoint a new Auditor General on a temporary basis and to allow the early consideration of Legislative Competence Orders coming back from Parliament on Sustainable Housing, School Governors and Culture. These LCOs need to be passed as soon as possible to give us a chance of getting them through before a General Election is called. However, the Government now do not propose to pursue the early discussion of the Sustainable Housing LCO. They will table it in the normal manner without the need for a suspension of standing orders. This is because the Tories will not cooperate with the procedural motion whilst the Housing LCO contains proposals to bring powers over the right to buy to Wales. In many ways this is predictable, in other ways it is bizarre. Yesterday the Tory group were lining up to call for a referendum to enable the Assembly to have full law-making powers over housing and 19 other areas in which we have responsibility. They also said that in the main they would vote 'yes' in that referendum, giving us the power to amend the right to buy. So why is it OK to acquire that power in a year's time but not now? Do the Tories actually understand what they are supporting or how the LCO process works? Their inconsistently on this issue knows no bounds. A new report from Imperial College London and the Zoological Society of London has concluded that badger culls are unlikely to be a cost- effective way of controlling bovine tuberculosis in cattle. The report, which studied the aftermath of cull trials in England, claims the benefits "disappear" after four years. Speaking on Radio Wales this morning, one of the authors of that report said that the evidence indicated that the churn created by killing badgers effectively doubles the prevalence of bovine TB in the cull area and causes the disease to spread to adjoining areas. She was adamant that the scheme proposed for North Pembrokeshire would not work. Prof Christl Donnelly, senior author of the study from Imperial College London, said: "Bovine TB is a big problem in Britain and the disease can profoundly affect farmers' livelihoods. "We know that it is transmitted between cattle and badgers, so the randomised badger culling trial was set up to find out if culling badgers would help control the spread of the disease. "There has been some controversy over badger culling as a bovine TB control method and it has been unpopular with the general public. "Although badger culling reduced cattle bovine TB during the trial and immediately thereafter, our new study shows that the beneficial effects are not sustained, disappearing four years post-cull." Prof Donnelly said the research also suggested the savings farmers and the government would make by reducing bovine TB infections in cattle were two or three times less than the cost of repeated badger culls as undertaken in the trial. "This is not a cost-effective contribution to preventing bovine TB infections in cattle," added Prof Donnelly. Government claims that somehow the Welsh Government's solution is different were not accepted by the interviewee on Good Morning Wales and are difficult to sustain. In any case it would be difficult to properly assess whether the proposals for North Pembrokeshire are effective simply because there is no scientific methodology being applied. There is no control area to measure the efficacy of the measures and no proper boundaries to the cull area that would prevent movement in and out of it by badgers. If this government is really evidence-based as they claim they would look seriously at this report and re-think their approach. Coverage of Norman Tebbit's remarks on immigration in yesterday's media was slightly misleading in that the headlines said he wanted a zero immigration policy when in fact he was calling for a zero net immigration policy. Nevertheless that distinction does not make his proposal any more acceptable or achieveable in the real world. I understand that as a right wing Tory he may want to restore a way of life that has not existed in this country before the second world war, but how can he, as a free marketeer justify the restrictions in trade and the movement of labour that his proposals would entail? According to the Office for National Statistics the number of people leaving the UK for 12 months or more reached a record high in 2008, with an estimated 427,000 people emigrating. This was up from 341,000 in 2007 and 398,000 in 2006. Compare this to the immigration figures which show that an estimated 590,000 people arrived to live in the UK in 2008, the second highest figure on record after 596,000 in 2006. Of all immigrants 505,000 (86 per cent) were non-British citizens in 2008. Net migration, the difference between immigration and emigration, decreased from 233,000 in 2007 to 163,000 as a result of increased emigration. What these figures show is a healthy movement of labour into and out of Britain, in which Britons go abroad to work, whilst others come here to take up jobs that in many instances cannot be filled by British nationals. Without that sort of movement our economy would grind to a halt. Furthermore I would argue that if we start imposing limits on those who can come into our country, then others will do the same to us, limiting opportunities for British citizens to work abroad. Does Lord Tebbit really want that to happen or does he want a return to our imperial past as well, when we pretty well did what we wanted no matter what other countries said? It is right that we clamp down on illegal immigration and take a tough line with those who commit crimes whilst they are here but we should not damage our own economy by adopting wrong-headed and unsustainable stances, nor should we abandon our long tradition of helping those in trouble from other countries, providing that we manage that effectively as well. Clearly there are issues about housing, benefits and medical treatment that need to be addressed but let us not fall for the lies and distortions that are bandied about in the tabloid press on this. We need a rational debate but one that takes account of the benefits of immigration as well as its downside. Yesterday's Sunday Times had an interesting article that outlines exactly why Liberal Democrats are lukewarm about Gordon Brown's proposed referendum on voting reform. They report that Michael Thrasher and Colin Rallings, who are professors of politics at Plymouth University, have re-run the results of the 2005 general election as if Brown’s alternative vote system were in place. They say that the results show that Labour’s majority in the Commons would have risen from 66 to 82, with the Tories getting 15 fewer seats. The Liberal Democrats would have gained an extra nine. Labour, with 36% of the popular vote on people’s first preferences, would have gained 364 Commons seats, equivalent to more than 10 for every 1% of the vote. The Tories would have secured 183 seats for their 33% of the vote, just five for every 1% of the vote. The fact that the Liberal Democrats would not pick up the 100 plus seats that they would gain under any proper proportional system is not so much relevant here, as the fact that the suggested new system would actually further distort the result to make it less proportional for all the three parties. At the same time, smaller parties who might expect to get seats on 10% or more of the vote in a decent STV system would remain unrepresented in Parliament. The AV system proposed by Gordon Brown amounts to no more than a last desperate throw of the dice by the Prime Minister, who has blocked reform in the past when it has not been in his interest. There is no principle behind the move at all other than self-preservation. That is why the Liberal Democrats will be tabling amendments to give voters a real choice by ensuring the referendum choice is between first past the post and the single transferable vote system; to bring forward the referendum to next May; and closing the loophole that would allow the next Government to kill the proposals without an Act of Parliament. At every General Election the pollsters try to make their mark in more ways than by predicting the result. They seek to define the debate itself. We have had 'Worcester Woman' and 'Mondeo Man' and now we 'Motorway man', a usually childless, youngish voter who lives in modern homes close to the main motorway networks, the less environmentally attractive pockets of England where planning permission for new developments is often easier to obtain. "Where these sort of people live is increasingly incidental; the homes they live in are temporary," said Richard Webber, visiting professor at the geography department of King's College London and the man who led the team that developed Mosaic. "Often these people will be couples who live near motorway junctions and who will drive off separately in the morning to the different towns and business parks where they work." The increasingly rootless nature of their lifestyle means old ties of community are no longer important. Instead, there is greater focus on material possessions, something that has major ramifications for the political process. "These people are much more politically and ideologically footloose," ­Webber said. "They look at political parties like some people look at cars. How they voted last time is not going to influence them this time. For them, it's purely a shopping experience." The group comprises about 15% of the electorate, said Webber. But it will have a disproportionate influence on the ­election because, according to Mosaic, it is significantly over-represented in key marginals in constituencies such as Crawley in West Sussex, Milton Keynes South in Buckinghamshire, Eastleigh in Hampshire and Dartford in Kent. Experian notes: "Given that this younger group are followers of celebrity culture, it is likely to be more responsive to ­personality politics, which means they are more inclined towards the perceived charisma of 'new man' Cameron over the perceived dourness of [Gordon] Brown." Labour's emphasis on improving public services is unlikely to hold much sway over the group, according to Webber. "They feel overtaxed, but they feel they are not getting much back from the state," he said. "Because of where they live, they don't encounter people from different backgrounds. They don't meet handicapped or old people; they don't have children; and they don't use public transport. So they don't meet people who benefit from the services they are funding. As a result, they don't see the point of all the tax they pay." I admit that I am cynical. It seems to me that the defining factor of such a group of people will be that they do not vote. If they are to decide the election as predicted then the parties will need to make a massive effort to get them to the polling booth at a time when respect for politicians and the level of political engagement by ordinary voters is at its lowest. It is a good try but really, the age of spin is dead and with it these easy marketing definitions of people's complex perceptions, needs and wishes all of which conbine to determine where they will put their cross, if they do so at all. It has been a busy Conference in Swansea's Grand Theatre and there is still a full day to go. So far I have spoken to four fringe meetings and made three platform speeches as well as had a number of meetings with campaign groups. I have another fringe today with the BBC on 'New decade, new media: The General Election and the social media landscape' plus a number of other meetings. The Conference itself has been really upbeat. The speeches by Kirsty Williams and Nick Clegg were outstanding and there has been a real buzz about the place. Our other MPs have performed well also. I really enjoyed Friday night's discussion, which involved Mike German, the Conservative David Melding, Labour's Alun Davies, Plaid Cymru's Dai Lloyd and Len Gibbs from True Wales talking about the referendum and the future of Wales. It was chaired by the Institute of Welsh Affairs' John Osmond and really got the Conference off to a good start. There are lots of media there and many many observers from organisations all around Wales. Indeed one of these observers told me last night that after spending a day in the Conference he is now 98% certain to vote Welsh Liberal Democrat at the General Election for the very first time. He was particularly impressed that we had the self-confidence to stage an all-party debate just months before Gordon Brown goes to the Country. A good weekend's work all round. I took part in an event with the Cardiff branch of theInstitute of Welsh Affairs on Wednesday discussing the role of new media and its impact on traditonal journalism. I formed part of a panel with Lee Waters, Alistair Milburn and Bethan Darwin. It was chaired by IWA Chair Geraint Talfan Davies/. A report of the discussion can be found on the IWA blog here. It is a really busy day at Welsh Liberal Democrat Conference so I may not have time to blog again until much later. I will content myself for the time being therefore in observing that this interview in The Times in which Sir. George Young is being touted as the man who will come riding to the resue of Parliament is very conveniently timed. Sir George Young of course, was the runner-up in the contest to become Speaker of the House of Commons and many MPs stil harbour ambitions to depose Speaker Bercow after the next election so as to install the bicycling baronet in his place. It cannot do any harm therefore to be portrayed as a scion of virtue even if actually delivering on a reform agenda may prove impossible. As the current Speaker is discovering taking MPs down this route is like herding cats in thunder. However, that will not concern his enemies in the Conservative Party, many of whom are more interested in getting rid of him than in advancing a reform agenda. I am not suggesting that Sir George is endorsing or encouraging any of this activity, just that the more publicity of this sort he gets the better are the chances of success of the putative coup d'grace later this year. The RSPCA has taken the campaign against the badger cull in North Pembrokeshire on-line with a new page on its 'give animals a voice' site here. They say: Badgers are under threat in Wales as the Welsh Assembly Government (WAG) has given the green light to a badger cull. The cull is part of a strategy to tackle bovine tuberculosis (TB) in cattle. The Minister for Rural Affairs, Elin Jones, has announced that a pilot cull will take place in an area of North Pembrokeshire, as well as parts of Ceredigion and Carmarthenshire. The RSPCA believes that this cruel cull is unnecessary and that other measures should be tried first, before badgers are simply killed. There is a petition and a request to write to your Assembly Member if you live in Wales. Please note though, if you live in South Wales West and are opposed to the cull then I am already on your side. Update: Another website is up and running as well called Save the Badger. This morning's Independent seems to have been put together on a theme - love bomb the Liberal Democrats. It is something we have become used to from the increasingly unsure leaders of Labour and the Conservatives but it must be a first from a national newspaper. 1. The most important change comes in the form of the mighty opinion polls, those trackers of fickle opinion that determine the political mood. Several polls point to a hung parliament. For now it does not matter whether such polls prove to be right on election night. Their significance is in their impact on the current situation. They give the Liberal Democrats an apparent importance that a thousand speeches from their leader or the revered Vince Cable cannot deliver. From seeming marginal, Clegg becomes a potential player, a leader with troops who could make a difference. 2. Cameron's policies are finally coming under a degree of scrutiny: the rootless, focus group driven oscillations in relation to their plans for "tax and spend"; the unreformed Euroscepticism; and the wider contradictory objectives. Suddenly the unquestioned common assumption that Cameron has moved his party on to the centre ground is being questioned a little. Or at least there is recognition that this untested, inexperienced political leader moves his party to the centre and then back to the right on a regular basis. As a result of such insecure manoeuvring, space opens up for the third party. 3. The fact that Brown is well behind in the polls persuaded him to back televised debates with the party leaders, another potential gift to the Liberal Democrats. Clegg will be the first Liberal Democrat leader in the party's short history to reach a huge television audience. I bumped into David Owen the other day who told me how such an opportunity would have been a dream for him when he was leader of the SDP in the 1987 election and an extremely authoritative media performer. 4. Brown has given one other gift to Clegg in the form of the Iraq Inquiry. Indeed Brown's pre-election appearance is the consequence of a question from the Liberal Democrats' leader. Almost certainly most voters are not following the Inquiry with the same intensity as parts of the media, which report developments that are seven years old as if they are breaking news. Even so senior Labour figures are rightly worried that the Inquiry is a daily reminder of the greatest foreign policy calamity since Suez and one that vividly brings to life the wider flaws of the New Labour project and its crusading timidity. But in the build-up to the election Clegg's pro-European, anti-Westminster, redistributive liberalism gives him an authentic and distinctive voice. At least he knows his voice will be heard when not so long ago it seemed as if he'd be drowned out by the clamour of the two bigger parties. We will have to wait and see whether he will take it, but he has a chance. If we are serious about reducing inequality – and there are good economic arguments for doing so, as the Conservatives acknowledge too – we should support this policy. It is a big public spending commitment but it should be achievable and its benefits are clear. Ensuring that more children do better in GCSEs will ensure that more people from disadvantaged families go to university, as last week's Higher Education Funding Council report showed. In the light of this sort of coverage, the General Election cannot come quick enough. Interesting article The Register on what they describe as draconian new laws in South Australia. The new Australian law came into force on January 6, and makes it an offence for anyone to comment online about state elections (including one shortly to be held in March) unless they also publish their real name and postcode. Failure to do so - even posting under a pseudonym - is now an offence. Media organisations will be required to keep posters' details on file for six months and face "fines of $5000 if they do not hand over this information to the Electoral Commissioner." They say that it is likely that the law will also affect anyone posting comment on newspaper websites, and could as easily apply to election comment made on social networking sites such as Facebook or Twitter. Such a law could have a major impact on newspaper sites here in Britain not to mention a number of anonymous blogs. I am not sure that I would want the UK Government following suit. Nick Ramsay: I thought that you would like it. The Presiding Officer: We would like a question, to learn why you are called 'the cash-back king’. Nick Ramsay: First Minister, in your discussions with LINK and other organisations, can you ensure that you focus not only on machines serving student populations and deprived areas, but on rural areas, so that people like me do not have to rely on shops being open to access cash? The First Minister: I would be more than concerned, as a politician, if I was referred to as 'the cash-back king’—especially if I used that description myself. [Laughter.] I advise you to be careful at election time, to ensure that you do not breach any of the rules set down by the Electoral Commission. The least he could have done is to name the pub so as to give them free publicity. The Guardian reports on a pledge by Gordon Brown that if re-elected he will serve a full term. Quite how this is meant to persuade people to vote Labour I have not worked out yet. An article in the Civil Service World newspaper from 27 January is drawn to my attention in which the Work and Pensions Minister, Jim Knight, who has recently been appointed as the government's lead on moving public services on-line, confesses to having a 'ongoing struggle' with officials about web access. During a question and answer session at the Dotgov Live Conference last week the Minister was asked how civil servants could be expected to engage with the public when they are banned from using many of the social media sites such as Youtube or Facebook, where members of the public voice opinions. In reply he admitted that it is "a frustration to me that so much is locked out because of our very low appetite for risk in this area." He explained that the fear is that civil servants accessing such sites from government computers would put the entire system at risk from hacking. While that is understandable he said, it is "an ongoing struggle that I have with government IT, because there are times that I want to use government IT and not just my IPhone." "I can't catch up with what was on the Today programme that morning or go on Youtube using government IT. There is so much I can't do." This is not a frustration felt by Assembly Members who have a far more liberal IT system though government civil servants and Assembly Commission staff are subject to the same restrictions as Mr. Knight. The Minister told the Conference that many public services will only be accessible online in the future, but he warned that this will require an acceleration of the digital inclusion programme so that some groups are not to be disadvantaged. About a third of UK households still do not have access to the internet and that needs to be addressed, especially in Wales where access issues can be quite severe for a number of reasons. Either way, if services are to be extended online then all governments will need to look at their policies in relation to their own civil servants accessing the web and even their Ministers. One of the debates in today's Assembly Plenary is on 'a sense of place - the value of local distinctiveness and heritage in Wales' communities'. On the on-line agenda there is a link to a supporting document described as a 'sense of place' toolkit. I was disappointed to discover that it did not contain a compass and map. Famously, George Orwell's Animal Farm started off with 'all animals are equal' and finished declaring 'four legs good, two legs better', It is clearly a sentiment with which Pope Benedict XVI might identify. According to The Times he is due to visit Britain later this year but already he is unhappy with what he may find here. He confirmed the visit in a pastoral address to the Bishops of England and Wales today where he also indulged in what Ruth Gledhill describes as 'a wonderful Benedictine attack on our nation's move to embrace equal rights for all, in which he urges 'missionary zeal' on the bishops in carrying the flag for religious freedom in Britain.' As she points out, religious freedom means the right for religions to discriminate against minorities, primarily gays. What he does not seem to understand is that unlike the Germany of his youth, Britain is a free country where religious diffences are tolerated and people are free to express their views even if they go against what is considered political correctness (just ask David Davies MP for Monmouthshire). If the Church's teaching against homosexuality in particular and its advocacy of 'natural law' is considered to be pushing against 'limitations' then that is because most of us are living in the twenty first century where we respect people's right to live their life as they wish. In contrast the Catholic Church as envisaged by the current Pope is still living in the sixteenth Century (and I write that as somebody who was brought up as a Catholic). If the Pope really intending to come to Britain to preach his version of intolerance then perhaps it would be better if he stayed in the Vatican. You have to give some credit to the new Education Minister, Leighton Andrews, he can produce a good turn of phrase. His response to the Tories wanting to scrap free school breakfasts is to label them 'cereal killers' and accuse them of wanting to 'take food from the mouths of infants'. We have been here before of course. The Conservatives argue that the money would be better spent elsewhere and that parents should be responsible for feeding their children. They are right but that is an ideal world. It does not work like that in reality, because many parents do not even get up to get their kids out for school never mind give them breakfast. Some of the advantages of the free breakfast scheme include getting the kids into school on time, being able to stagger school transport arrangements and ensuring that their concentration is improved so as to actually learn something. There is also the benefit of socialisation that would not otherwise be available and the fact that we can educate children as to the advantages of a healthy breakfast. The cost of this scheme is not vast in comparison to the rest of the budget and as always, the Tories' plans for the money far exceeds the cash that is available. We are not going to even dent the £540 difference in per pupil funding between England and Wales with this money for example. If I were to do anything different it would be to give the schools a bit more discretion in how to spend the money. Some schools don't want to deliver free breakfasts for example, should they not have an equivalent sum to improve school dinners or to provide other nourishment during the day? Perhaps they might prefer to use the money to fund an after-school club. Maybe a bit more flexibility all round might lead to improved benefits.